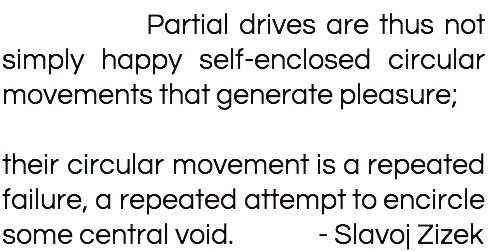 “in fighting its external obstacle, the blind non-sublatable repetition, the dialectical movement is fighting its own abyssal ground, its own core” – In other words, the ultimate gesture of reconciliation is to recognize in this threatiening excess of negativity the core of the subject itself. ..In pure repetition, the dilectical movement of sublimation ..encounters itself outside itself, in the guise of a ‘blind’ compulsion-to-repeat. 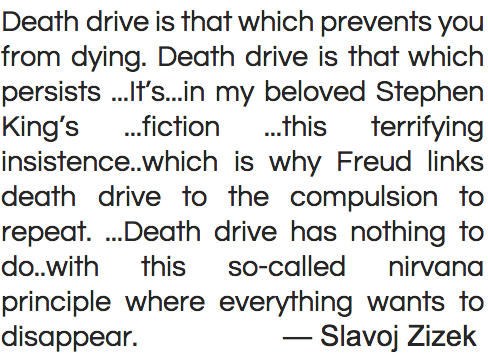 ..The relationship between Hegel’s negativity + Freud’s death drive (or compulsion to repeat) is thus a very specific one.